What better way to finish off lunch than with an ice cream sundae? Two teachers at Marlton Middle School got a little more than they bargained for when they volunteered to let students make them into ice cream sundaes, with money raised going to the school’s Beautification Project. Language Arts and Reading Teachers Michelle Luongo and Scott Powell were chosen from among 16 teachers who volunteered to become ice cream sundae heads in front of the entire student body at lunchtime on Wednesday, June 11. Students “voted” by putting coins in penny jars for the teachers they most wanted to see “ice creamed” — complete with ice cream, hot fudge, and all the toppings. 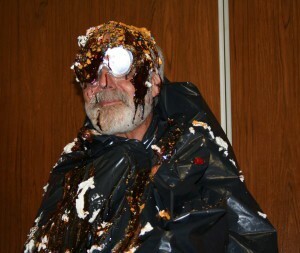 Students also could pay to have a chance to be one of the two students who whipped up each teacher sundae. The $450 raised has already been put to good use as the Beautification Project has been completed. Laurel Oak Landscaping, along with the help of Marlton Middle School staff and students, planted new shrubs and trees, added mulch to the school grounds, and completed other projects to beautify the outside of the school building.